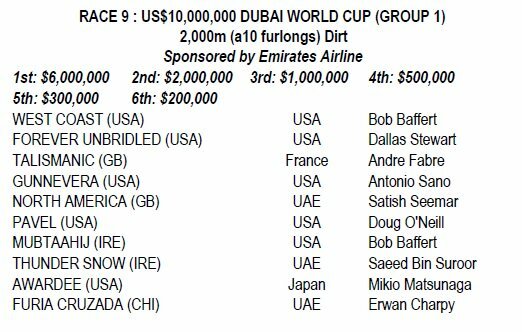 Thursday's fifth meeting of the 2018 Dubai World Cup Carnival was highlighted by the US$250,000 Al Maktoum Challenge R2 sponsored by Gulf News (G2) over 1900m on the dirt. 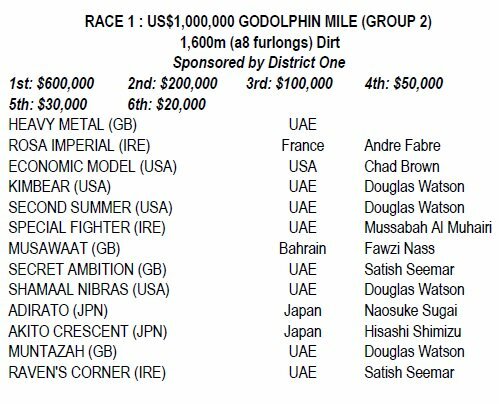 Won by Godolphin's multiple G1 winner Thunder Snow, whose appropriately named half-sister Winter Lightning had landed the UAE 1000 Guineas earlier in the evening. 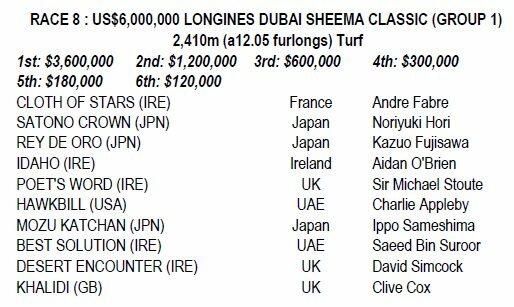 I watched the Al Maktoum Challenge race this morning and thought that Thunder Snow looked really good. 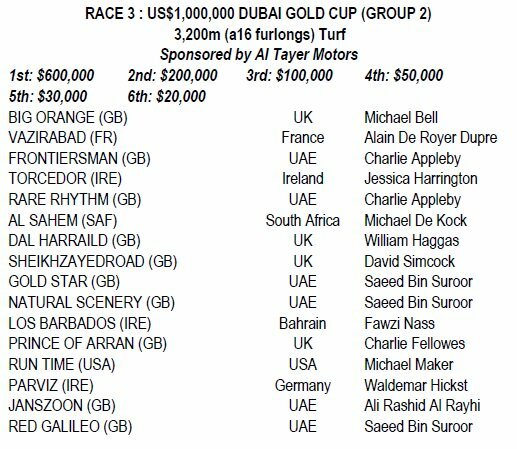 Since it appears that the US isn't sending any Arrogate/Gun Runner-type monsters to the World Cup this year, perhaps the Godolphin colt stands a chance? It’s really hard to tell how good horses are there because the times are slow. Rayya won the Oaks in impressive, front-running fashion. Winter Lightning just couldn't quicken in the stretch and barely hung on for third. Rayya is by Tiz Wonderful, out of (if I heard correctly) a Coronado's Quest mare. All US dirt breeding, so I wonder if we'll see her here in the Ky. Oaks? Of course, Tiz Wonderful was shipped off to South Korea in 2014, another good stallion by Tiznow that IMHO was sold too soon. Rare Rhythm beat Vazirabad in the Gold Cup. 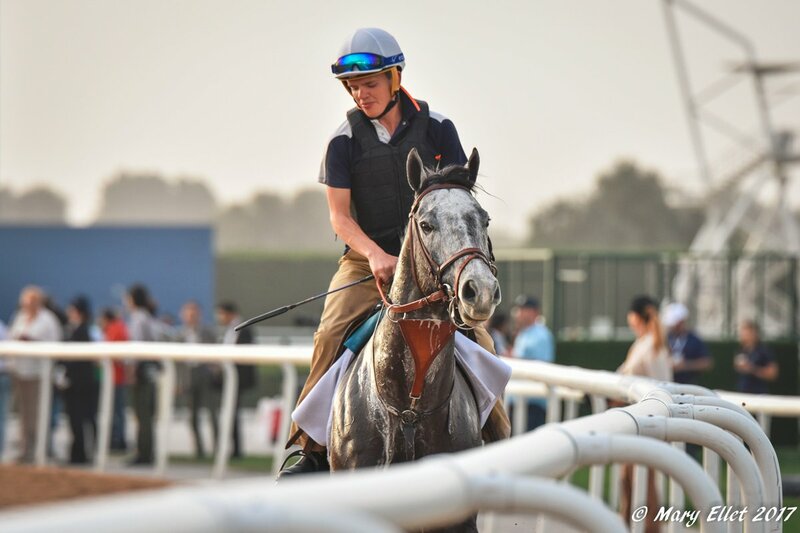 "On a Chantilly card which has produced Meydan winners such as Solow and Cirrus Des Aigles, Talismanic put in a fine display ahead of an audacious Dubai World Cup bid. Last season's Breeders' Cup Turf hero stretched out in fine style to account for Arc runner-up Cloth Of Stars in the Prix Darshaan over an extended mile and a furlong of the Polytrack." Talismanic could provide a bit of an upset in the World Cup. He is by Medaglia D'Oro, so he has the breeding for the brown stuff and it doesn't look like the US is sending any monsters this year. 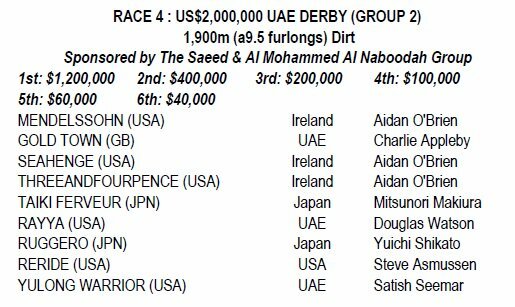 North America beat Thunder Snow in the 10 furlong G1 Al Maktoum Challenge R3. TS tracked the leader but was one-paced and could not make up the ground. If 'Snow can't locate his stretch kick in the coming weeks, I don't think he's going to threaten either West Coast or Talismanic. Hawkbill won an exciting duel with Frontiersman in the 12 furlong G2 Dubai City of Gold. The two favorites battled through the whole stretch, but the Kitten's Joy colt (who looks SO much like his sire) was in for the fight and won by what looked like a neck. 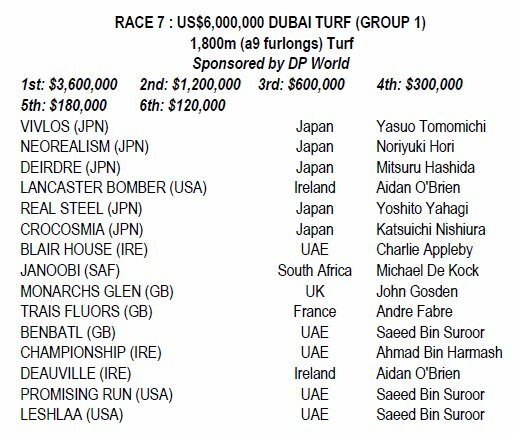 Both the dirt and the turf were playing really fast at Meydan; I think I heard the announcer mention that four track records had been set today, two on the dirt and two on the grass. ETA: Paulick has a nice rundown on the whole card. Todays Paulick Report talking about West Coast and his preparations for Dubai, states Trained by Bob Baffert, West Coast will have Mike Smith up in the Dubai World Cup. 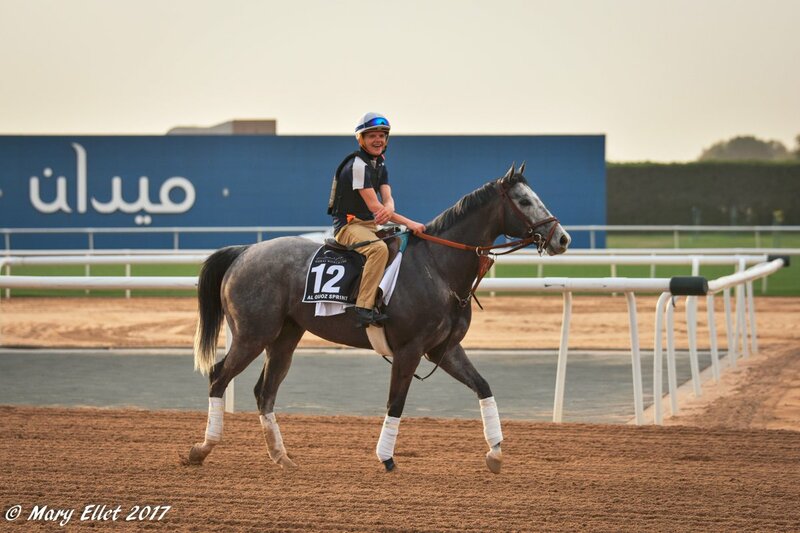 honneerider wrote: Todays Paulick Report talking about West Coast and his preparations for Dubai, states Trained by Bob Baffert, West Coast will have Mike Smith up in the Dubai World Cup. I think it's a mixup on Paulick's side because you are correct multiple sources were talking about the musical saddles game going on what with some regular riders of Dubai mounts staying stateside for Derby preps. Owner Ivan Rodriguez said Monday Cigar Mile winner Sharp Azteca will stay in the U.S. instead of shipping overseas to run in the Goldolphin Mile March 31st. Rodriguez told Daily Racing Form the 5-year-old son of Freud suffered a minor injury following a workout. Sharp Azteca was last seen finishing eighth in the Pegasus World Cup in late January. He was extremely sharp in 2017, winning four graded stakes, including the Grade 1 Cigar Mile, and he finished second in the Breeders' Cup Mile. RICHARD'S BOY (USA) going for a jog this morning. 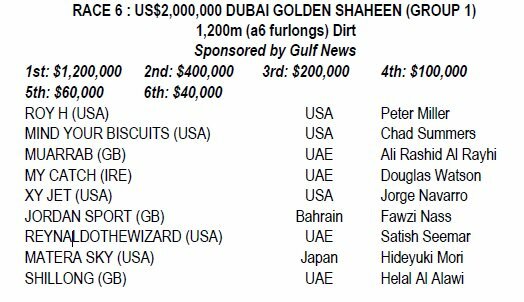 Nice to see another California-bred in Dubai! Bummer but I'm glad they're being cautious, and if he can get some down time on the farm, it's a win for the horse too in my book. Thanks for posting the entries, Stark. It's a very exciting card and I'm sorry I don't have TVG anymore to watch them. XBTV will have live coverage of the DWC starting 6:30 am Pacific Time on Saturday. They'll also have Golden Gates, Gulfstream and Santa Anita coverage. BaroqueAgain1 wrote: Rayya won the Oaks in impressive, front-running fashion. Winter Lightning just couldn't quicken in the stretch and barely hung on for third. Rayya is by Tiz Wonderful, out of (if I heard correctly) a Coronado's Quest mare. 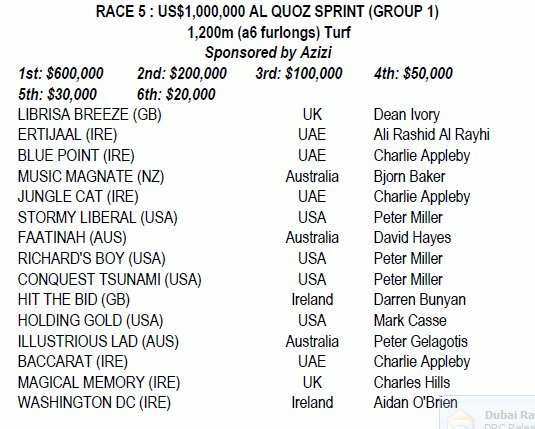 All US dirt breeding, so I wonder if we'll see her here in the Ky. Oaks?